Please allow me to take a few minutes to tell how we go interested in these wonderful animals called YAKS. My wife Colleen and her family of 2 boys and 2 girls started raising buffalo 20 years ago on this same property along with a breeding Rocky Mountain Stud and a few mares. As some time progressed the horses were scaled back to a few for personal pleasure. The stallion was retained for breeding a few select outside mares. The buffalo however became the full time passion and the herd grew to approximately 15 cow calf pairs and a breeding bull. They were pastured within the 20 irrigated acres of natural high mountain pasture and were only fed the same natural grasses in the hay that was purchased every summer for winter feed. They were sold as natural grass-fed/organic/non-medicated lean red meat and after a very short period of time, from word of mouth from their customers, they could not sustain enough meat for the demand. Their customers understood this and remained loyal, sometimes sharing 1/4 or a half portion with other willing customers to get the excellent meat. I became a member of this wonderful family when Colleen and I married in 2007. The 4 kids were now grown and had "flown the coop" except the youngest boy and he was a senior in high school. Colleen was and is an RN at our local hospital. I was retired and so everything worked out well at our place taking care of animals, remodeling of the present house, along with building barns,sheds, corrals and building a new home over the next 2 years. Then we built new fences, rearranged pasture configuration and settled in for an enjoyable retirement. Noel, the youngest son, now had left for college and immediate employment. I had been a very active individual in both agriculture and along with a life long career in the oil and gas industry, so after these improvements were completed on our place, I became bored with very little to do. I did a few odd jobs around the valley but ultimately took a full time job back with another oil and gas company 200 miles from our house. This required me to stay there through the week and sometimes longer. During my time of becoming "active" again, my wife became very busy with her career not only as an RN but she achieved her CEN certification. She was promoted to ER lead nurse and is also Star Valley Medical Center's trauma coordinator. constantly concerned about animals getting out while during our absences. We sold most of them to a breeder in central Utah, butchered the ones promised, and sold the herd bull to a gentleman in Louisiana. 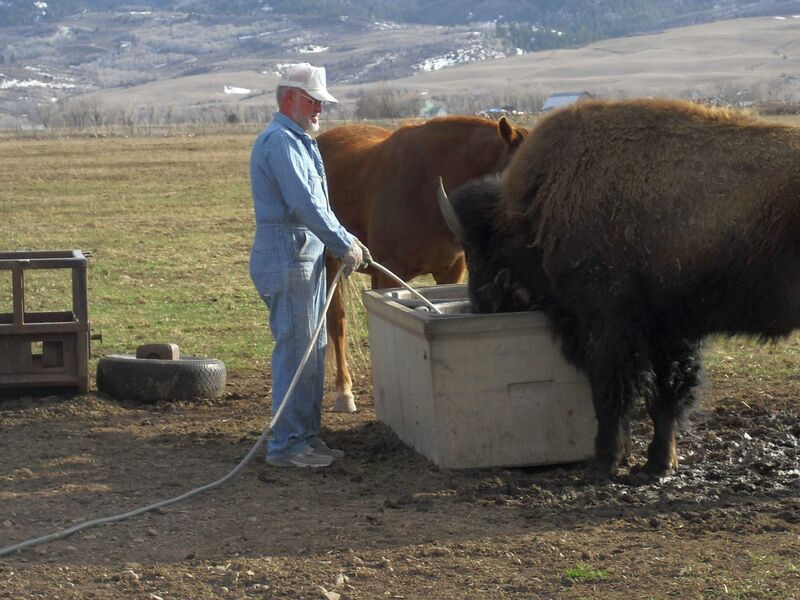 We hated this because they were like family and the herd bull would eat hay cubes from my fingers every day, but we accepted this and moved on. However, in a very short time we realized we needed animals around again but something that wasn't hard to manage, was easy on equipment, took minimal time to feed and no interaction during calving. Our research on animals that fit these requirements, along with less feed ration to animal, with the bonus of being enjoyable to be around with out fear of animals getting out and equipment being destroyed, but yet held to our strict requirement of extremely lean moist red meat, got us very interested and later infatuated with the YAK. They are the size of a jersey cow, consume 1/3 the feed of a cow and thrive in our high mountain valley environment. They are known for calving ease, extremely disease resistance and very personable. They are very enjoyable to watch as they romp in the meadow with their horse like tail straight in the air when they run. When properly trained (we haven"t had time yet), they can be milked, used as a pack animal and you can shear the hair using it for yarn material. The meat is delicious, making them an all purpose animal. There are nationally sanctioned Yak shows and exhibitions around the country for displaying your stock. Not to mention extremely lean meat for butcher animals. 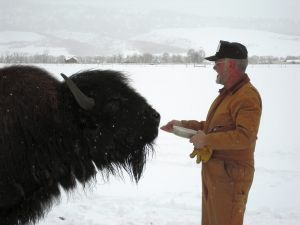 We purchased our beginner (seed) cows and bull from the Rocking Y ranch in Sun Valley Idaho. The Yetner's were very knowledgeable and were most helpful with our questions and ultimately getting started. 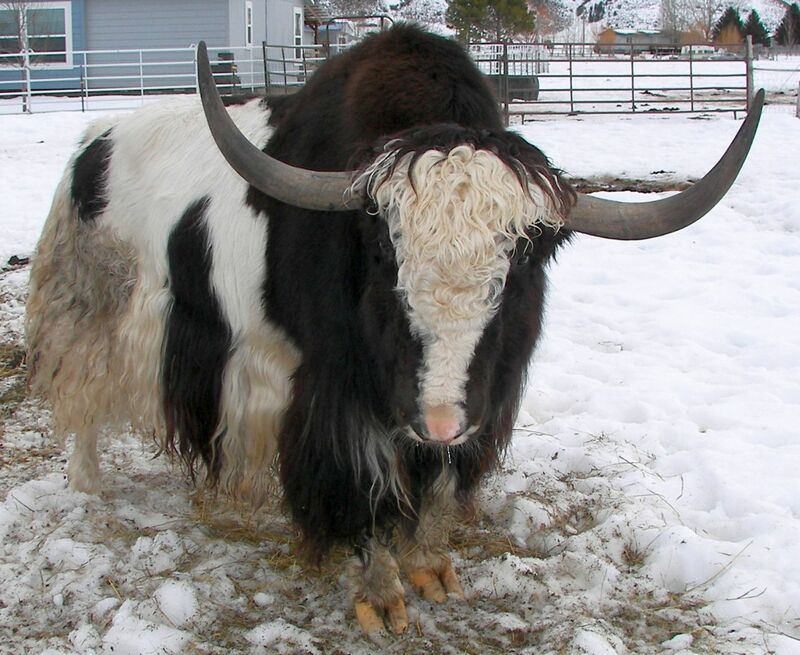 Their herd is a big carrier of the Golden Gene, which is rare in the YAKS producing a Royal (black and white hide similar to Holstein cow markings) however, gold and white are a honey brown to blonde color. We were fortunate enough to have a golden royal bull calve born in the 2014 calving season. 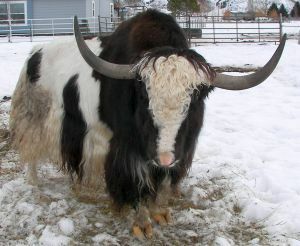 According to various website information, there are only about 50 golden yaks in the United States. We have all 5 of the colors represented in Yaks in our herd. You can get onto the internet and read all about this wonderful and interesting animal, the information there may answer any questions you may have or please feel free to contact us any time at our address listed or set up an appointment to come see them. We would be happy to share any information we can or help you get the information you need.